Its seems the two most powerful president in the world; US President, Donald Trump and Russian President, Vladimir Putin is not on the same side when it comes to gadget, Gold phone. If you have been following international political news, you most have come across the Gold plated Donald Trump iPhone following that heels is a Gold and Titanium Caviar Nokia 3310 Supremo Putin. 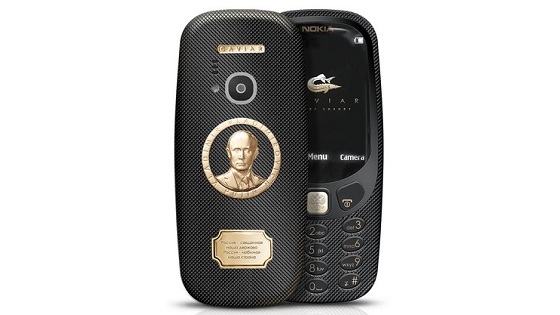 The Gold and Titanium Caviar Nokia 3310 Supremo Putin is made from Russia with love. The company behind this novelty is Russian firm Caviar. Just as the Trump iPhone has Donald's image on the back; this luxury 3310 model has Putin image on the back as well. With all indication, it shows that Putin fans are not in any way allowing Trump fans get away with a luxury phone in honor of the Big D.
Having said that, owning a Gold & Titanium Caviar Nokia 3310 Supremo Putin will definitely stand you apart from the maddening crowd of outrageous users who is ready to buy the retro model. You would be carrying around a beautiful device worth about $1700. And of course, Gold plated Donald Trump iPhone is not in anyway compare with the Gold and Titanium Caviar Nokia 3310 Supremo Putin, you already knew that an iPhone 7 is not in the same league with Nokia 3310; didn't you? and apart from the outstanding feature, the Trump's iPhone cost about $151,000 compared to the Caviar Nokia 3310 Supremo Putin.